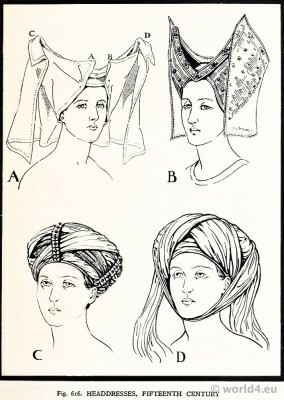 Home » Headdresses 15th century. The Reticulated Headdress. Plate XXII. Isabelle of Portugal 1428-1496 Queen of Castile and Philippe le Bon 1396-1467 Duke of Burgundy. Headdresses 15th century. The Reticulated Headdress (Latin, Reticulum = a net). At the hall door take off thy hood and gloves. Observe in Curtseie to take A rule of decent kind, Bend not thy body too far forth, Nor backe thy leg behind. Curtesy came from Heaven when Gabriel greeted Our Lady. All virtues are included in it. This form of headdress may be said to have made its first appearance in the age of Classic Greece. 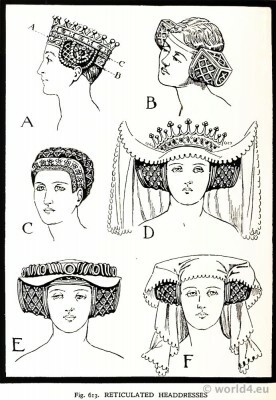 Ladies of Rome also wore nets of gold thread, called “Reticula,” to cover their hair, a fashion copied from the Greeks. 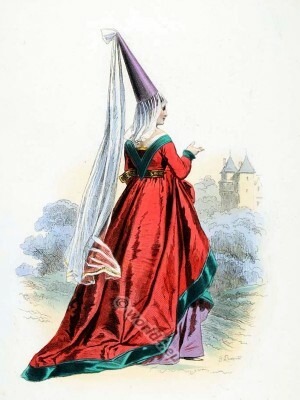 The headdress which came into fashion during the second half of the thirteenth century was of this nature, although it was known as the crespinette. It went out of use during the early years of the reign of Edward III., surviving thereafter for only a short time as the side cylinders. The third appearance of this headdress occurred at the end of Richard II. ‘s reign, following on the introduction of the style of hairdressing shown in Fig. 397. A young lady at the time of marriage of Isabeau de Bavière in 1385. In the time of Henry IV. the side pads of hair were encased in net bags—cauls—often composed of gold thread with pearls or jewels set at the intersections. These are seen worn by Queen Joanna in Fig. 505, and at this time they left the ears exposed. A little later the cauls increased in size and left only the lobe of the ear visible, as shown in Fig. 504. Fig. 504. 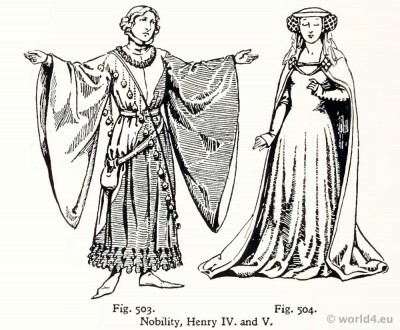 Nobility 15t century. Temp. Henry IV. and V.
Fig. 506. Noble Lady, temp. Henry IV. and V.
In both these examples, and in all cases where side cauls were worn, they were attached to a fillet or band round the head. Fig. 506 shows the network which covers the side pads extending also over the top and back of the head. In this case the network is shaped in one piece. 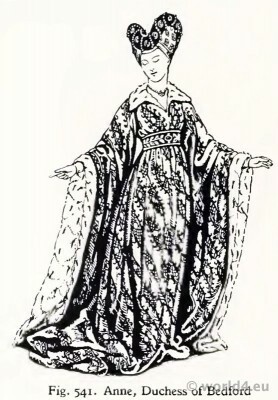 A roll of stuff entwined with pearls and set with jewels was worn by noble ladies on top of this type of caul, as shown in Fig. 507. Fig. 507. 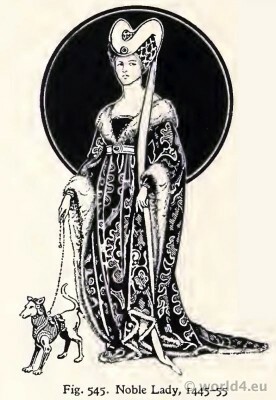 Noble Lady 15th century. Temp. Henry IV. and V.
Another version is given in Fig. 613 E. An elaborate headdress worn during the reigns of Henry IV. 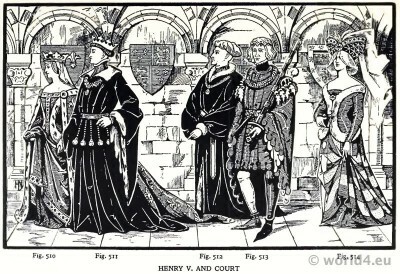 and Henry V. is shown in Fig. 613 A. The shape of the side caul has changed to that shown in Fig. 613 B (a truncated cone, flattened on the upper surface), and it was made of gold wire set into narrow metal frames in three connected pieces. In this the hair was confined. In Fig. 613 A, the fillet or band A B is wide and richly chased (sometimes the visible part of the back portion b was omitted) and the side cauls leave the ears exposed, a detail peculiar to the reign of Henry IV. In this model the top of the head is covered with network having square plates set with jewels at the intersections. A coronet is worn over this headdress, its bottom rim being shown at C. Before the coronet was placed in position it was usual to drape a veil over the back part of the head, and this the coronet kept secure. Sideview: Dame nobles de 1495 à 1500. Hair Fashion from 1495 to 1500. 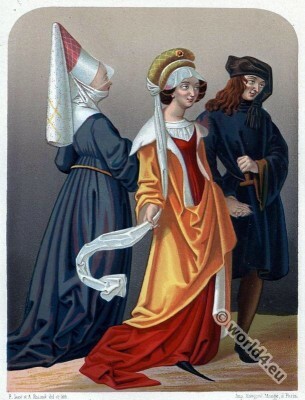 Front view: Dame nobles de 1495 à 1500. 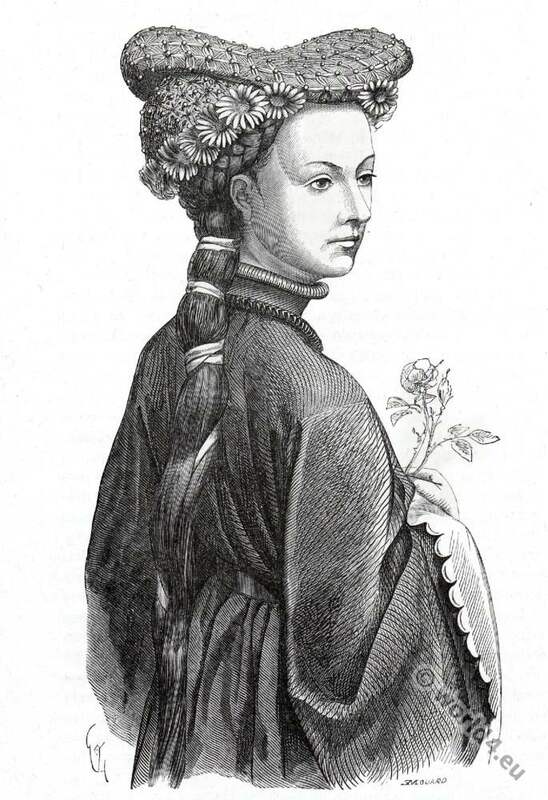 Hair Fashion from 1495 to 1500. 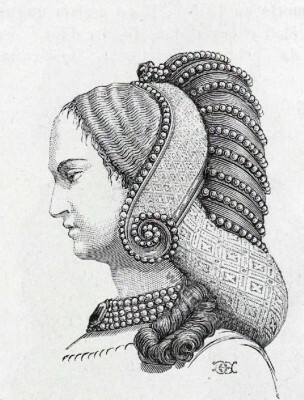 A reticulated headdress of the same reign, without the side pieces, is seen in Fig. 613 C. The head is covered by a cap of large mesh, having square ornaments at the intersections. A rigid frontal piece, decorated with metal studs or jewels, is placed high on the forehead, and below it appears a narrow wirework or gold thread band, which fits close on the brow. Fig. 613 D shows the well-known reticulated headdress taken from the monument of the Countess of Arundel, in fashion during the reigns of Henry IV. and Henry V. The wirework frames project more at the sides than in the examples just described, and cover the ears. Above them and at right angles to the head a piece of wire curves upwards to carry the rectangular veil, with pinked edging, which hangs at the back like a casement curtain. Surmounting this is a coronet. Ladies of less exalted degree used a circular roll of material ornamented with jewels, pearls, and plaques of enamel, in place of the coronet. Fig. 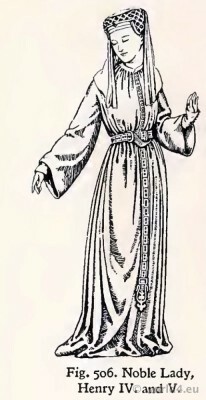 613 E gives another version of this same headdress, but without the wires and the veil (see also Fig. 507). 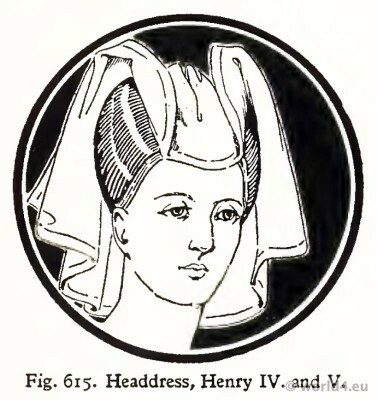 The top of the head is covered by a shaped piece of linen or coloured silk, surmounted by a roll decorated with plaques of enamel and twists of cord, or with jewels as shown in Fig. 507. Fig. 613 F has the cauls covered by a circular veil caught at the sides to the band on each temple, and so arranged as to give very graceful folds on each side. Plate XXI. 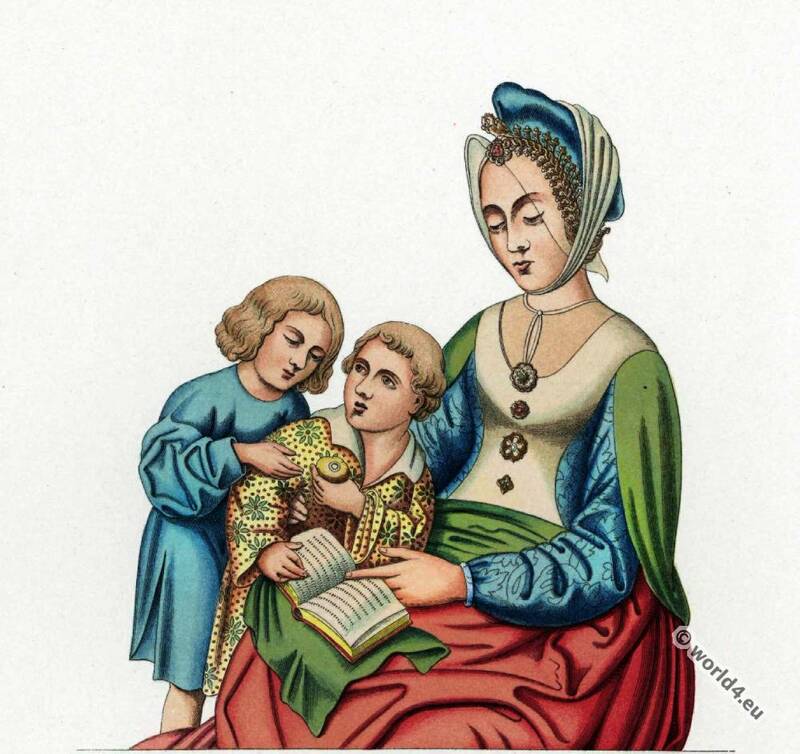 Christine de Pisan 1364 – c. 1430 presents her Book to Isabeau of Bavaria c. 1370-1435. 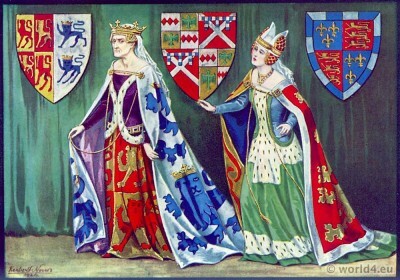 During the reign of Henry VI. a reticulated headdress of a different shape was worn. 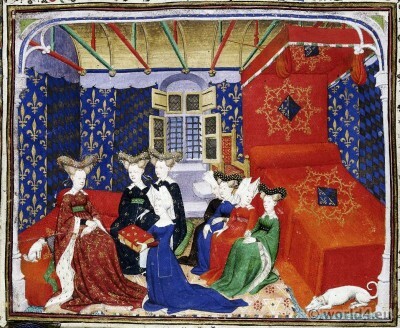 It was in favour in France from about 1410 onwards, and an illumination in a MS. of this date shows Isabeau of Bavaria, Queen of France, wearing it (see Plate XXI. a). 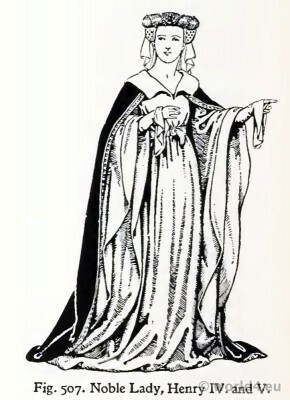 Her appearance is generally similar to that of the lady shown in Fig. 541. 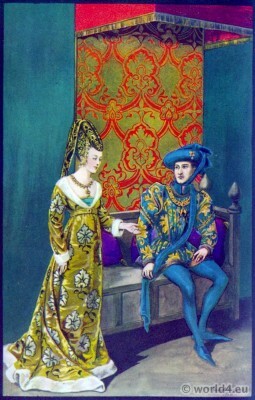 Fifteenth century costumes in the reign of Charles VII. Princess with her ladies. 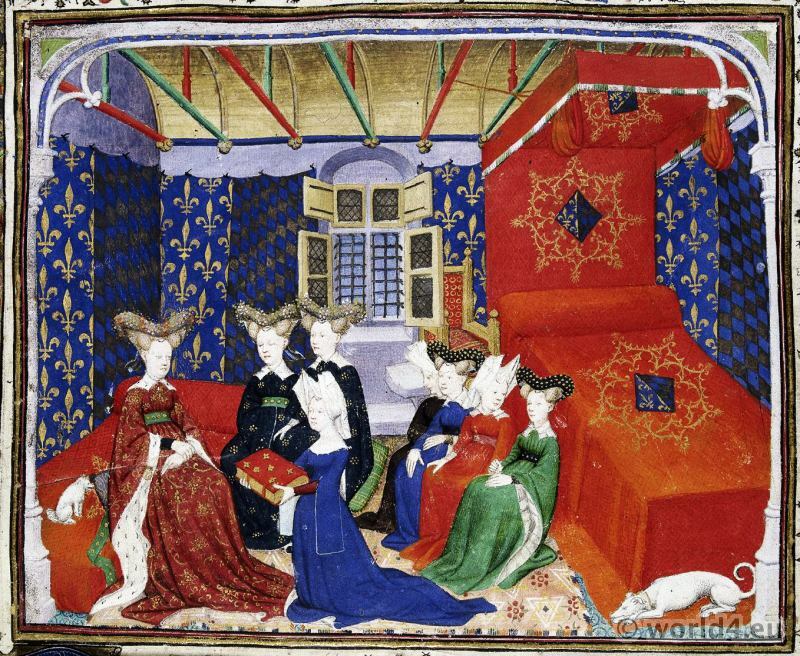 After the book of Tournament of King René (René of Anjou 1409 –1480, le Bon Roi René). This latter figure is reproduced from the Bedford Book of Hours, 1423, wherein one sees the front view of the headdress given in Fig. 614 B. The network takes the shape shown in Fig. 614 C, encircling the sides of the face, exposing the lobes of the ears, and continuing round the nape of the neck. The side pieces take a curved line upwards, forming stunted horns on either side. This is usually referred to as the “Heart-shaped headdress.” An oval roll of rich material is placed on top of this framework, as seen in Figs. 541 and 614 B, resting on the forehead, surmounting the horns, and descending in a large curve at the back of the head. The network and roll in this particular case (Fig. 614 B) are richly decorated with jewels. The band which edges the network is set with oblong rubies and groups of three pearls, and the network itself is composed of two rows of pearls having circular rubies alternating with emeralds at the intersections. The spaces between show the foundation of gold tissue, and occupying the centres are lozenges-shaped rubies alternating with emeralds, each with pearls at their points. On the forehead, under the roll and emerging from the caul, is a narrow band of brilliant colour, in contrast to the roll; this is set with pearls. The roll of some richcoloured silk is entwined with a double row of pearls, one row white pearls, the other black; and between are clusters consisting of a ruby with six pearls, alternating, with a sapphire and six pearls. Plate XIX. 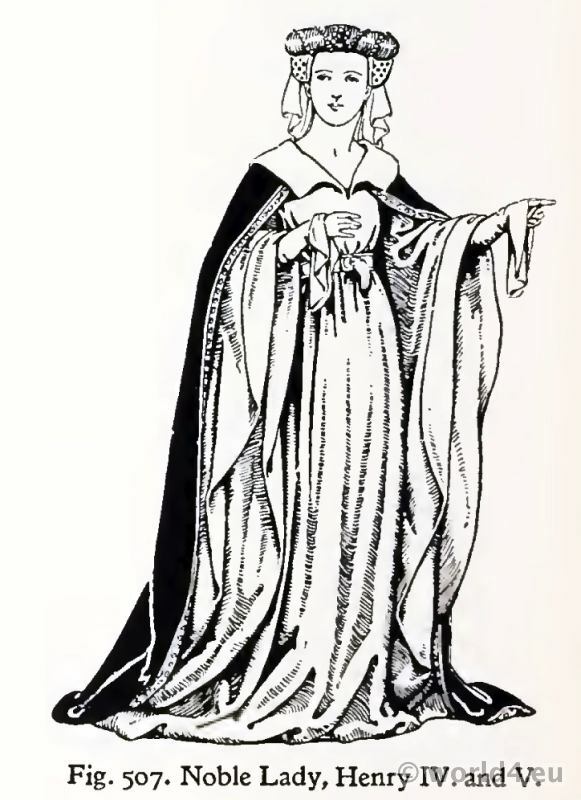 Margaret Princess of Wales 1456-1485, Joice, Lady Tiptolt, 1460. Fig. 615. Headdress 15th century. Temp. Henry IV. 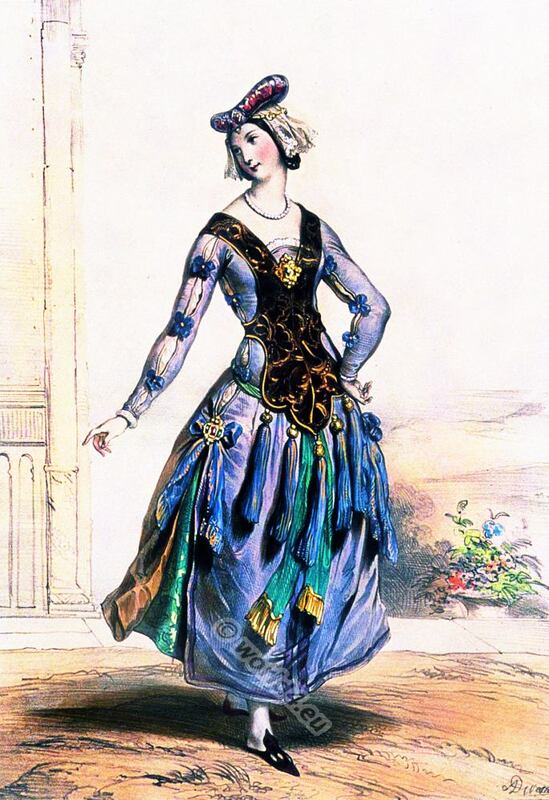 and V.
The headdress worn by the young noble lady in Plate XIX. is heart-shaped, but in that example the side cauls are separate, being fixed to a band round the head. Between the cauls a small semicircular veil is arranged, folded somewhat in the manner shown in Fig. 615. An ornamental band of gold, 2 ½ or 3 inches in width, encircles the complete headdress, including, in this case, the veil behind, although sometimes the veil was worn hanging over the band at the back. About 1440 the liripipe of the men was added to the ladies’ heart-shaped reticulated headdress. This fashion, adopted from Burgundy, may have originated in Spain or Portugal, as it is worn by the Duchess of Burgundy (see Plate XXII.). In this example it is of no great length and made of the same black and gold brocade as the roll. Fig. 545 shows a longer liripipe of plain colour, starting from the back part of the roll. Dennington Church, Suffolk, contains a monument to the memory of William, Lord Bardolf, K.G., a hero of Agincourt, treasurer of the household of Henry V. and chamberlain and privy councillor to Henry VI. He died in 1447. The headdress worn by his wife is given in Fig. 614 D, and is another elaborate example of the reticulated style. Its sides and back are covered with a wide trellis-work of gold and red enamel, the intersections set with jewels, and the intermediate square spaces filled in with four pearls set in gold. 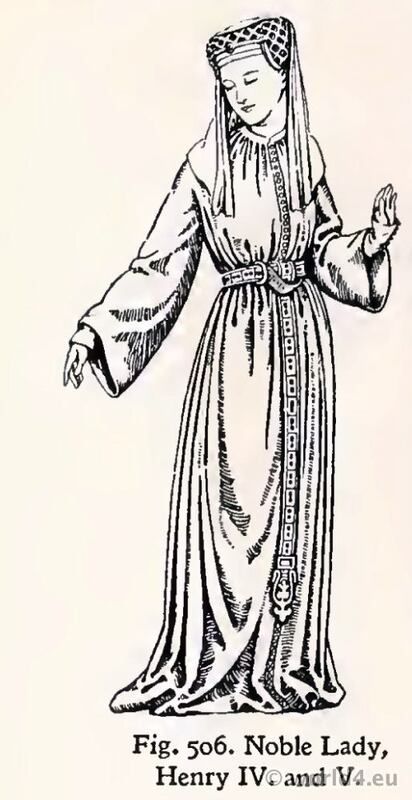 Before the cauls were placed on the head one side of the veil was fixed tight round the forehead, and, when the headdress was put on, the back part of the veil fell outside it at the back. Over all was set the coronet, shaped to surround the semicircular side pieces. A view of the top of the head is shown in Fig. 614 E. This lady wears a cotehardie, a sideless gown edged with fur, and a mantle bordered with gold passement. 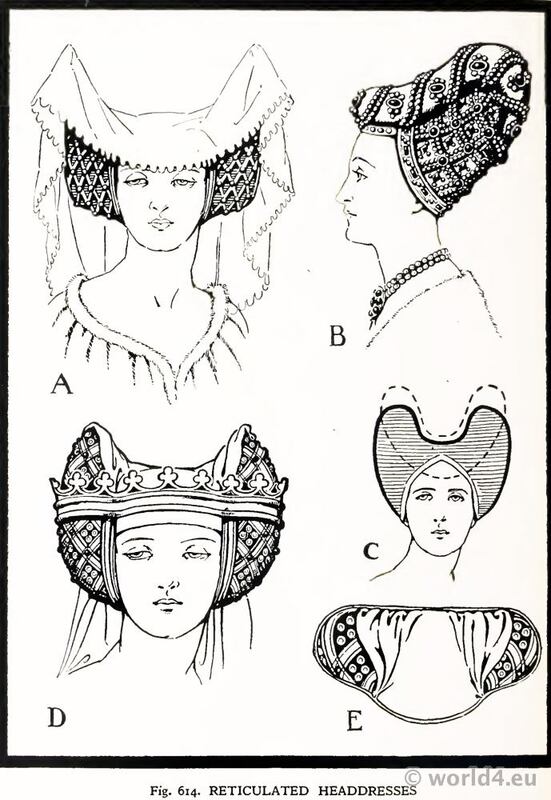 The heart-shaped headdress, reticulated or in various materials, continued to be used by the middle classes during the greater part of the fifteenth century, even after fashionable women had discarded it about 1465-1470. 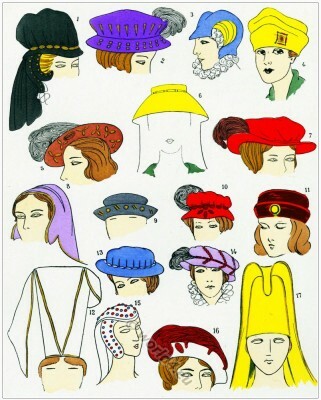 Several other headdresses of this period cannot be classified under the two main categories, the Reticulated and the Hennin. The following are some examples. Fig. 615 is a headdress in fashion during the reigns of Henry IV. 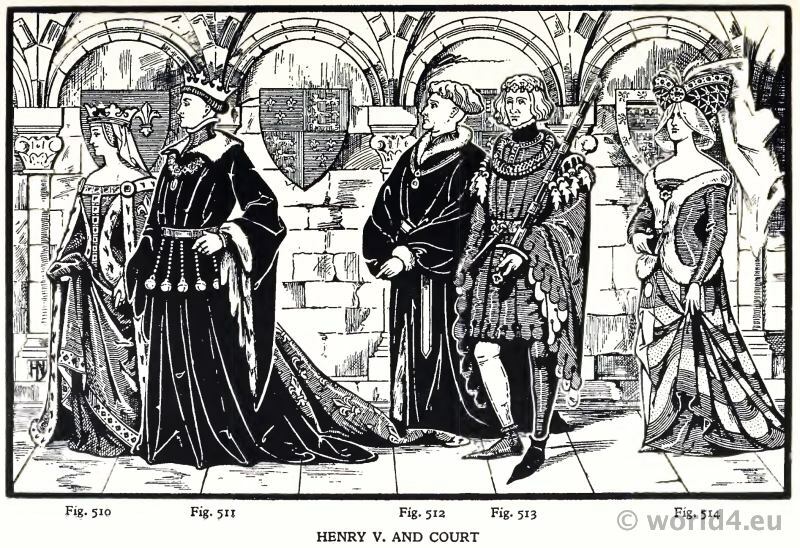 and Henry V. It entirely enclosed the hair and consisted of an ovalshaped cap of some material—cloth of gold, silk or cloth—mounted on a stiffened foundation and edged with a narrow band of passement or other trimming. Its chief feature is the semicircular stiffened veil, about forty-eight by twenty-four inches, the straight edge so arranged, turned back, and pinched here and there, as to give the lines clearly indicated in the drawing. It was fixed to the cap by two pins under the turnedbackedges. Fig. 616. 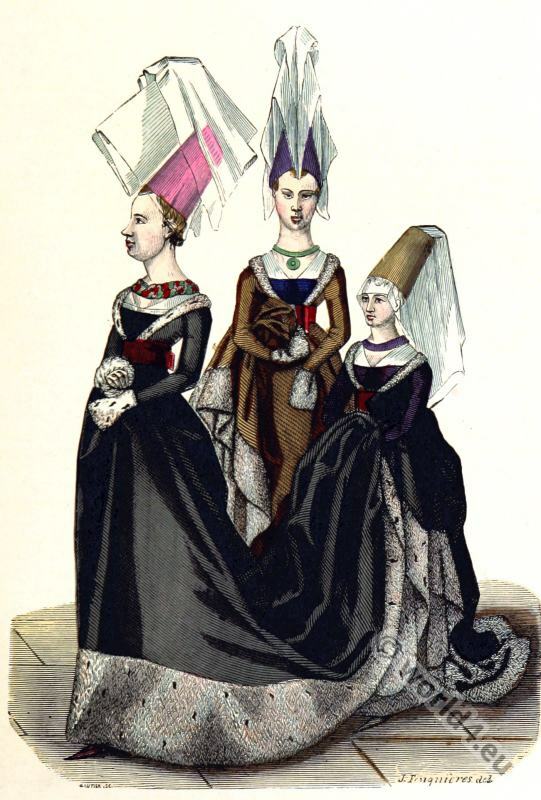 Headdresses 15th century. 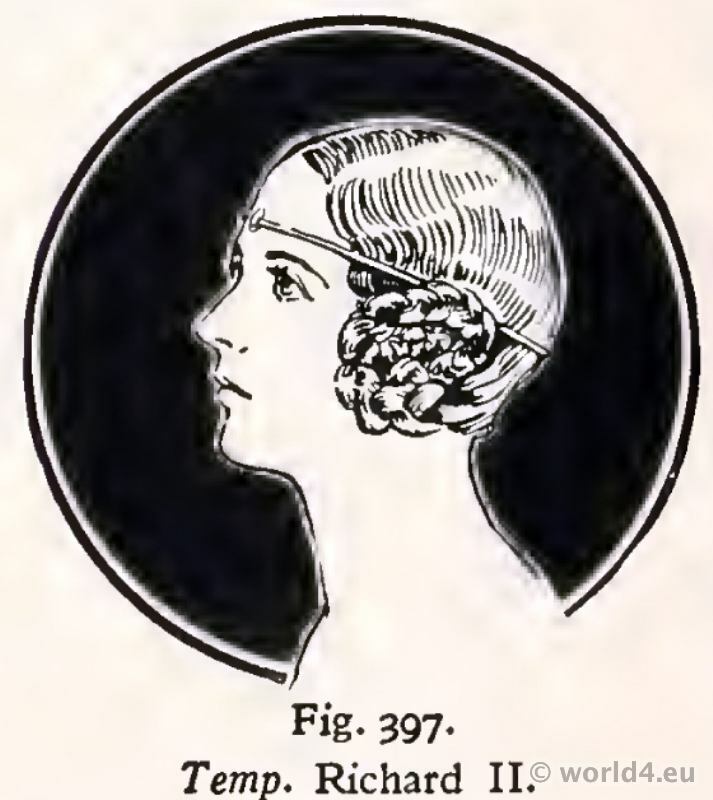 The headdress shown in Fig. 616 A, was in general use among women of the nobility and middle classes. It is familiar by reason of the various portraits of the poetess Christine de Pisan, who is always depicted wearing this style. First the hair (unseen) is dressed to the form outlined in Fig. 614 C. This is done naturally or by artifice. Around this erection of hair is placed a rectangular piece of stiffened linen about thirty by sixteen inches, the long edge passed round the nape of the neck, over the ears, with the two corners A and B sticking up in front. The centre of the corresponding long edge is bent round to meet the top of the forehead, and the two edges on each side are pinned together on the temples; by this method two points are formed standing up one on each side of the head, C and D. At these points it is necessary to pin the two edges together. A second piece of stiffened linen, about thirty by thirty-two inches, has a fold about four inches deep on its thirty-two-inch edge, and is fixed by pins to the two upstanding points C and D of the first piece, sinking in a curve on to the top of the head, as clearly indicated in the drawing. 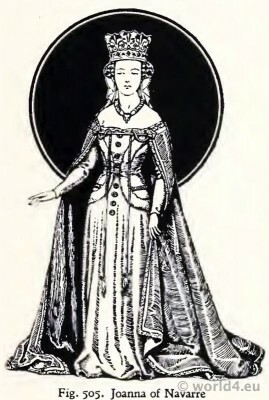 The description of the headdress worn by the noble lady in attendance on Queen Catherine, given on Fig. 514, applies also to the headdress shown in Fig. 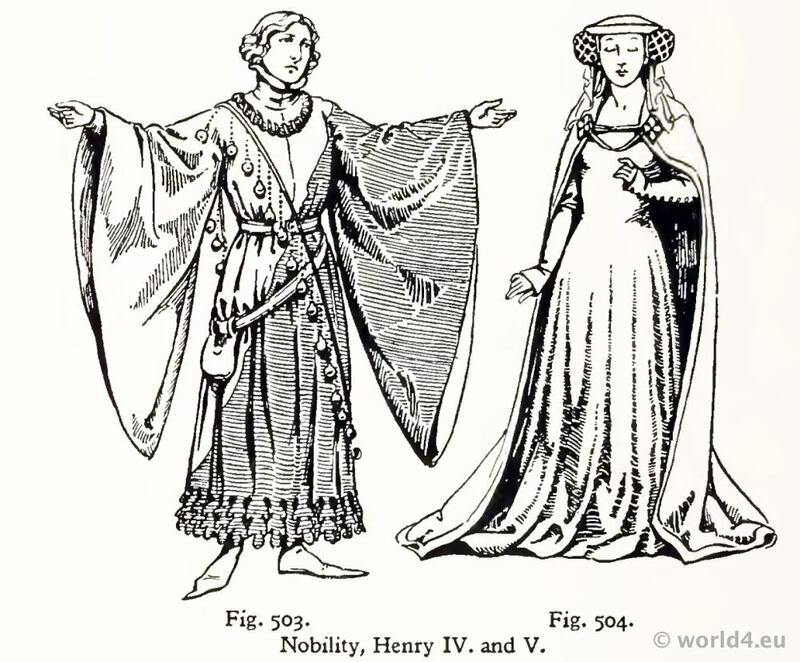 616 B, in fashion during the reign of Henry V. and the first years of Henry VI. The opening “valves of a shell” are made of gold tissue studded with jewels, and mounted on a light framework, having a border of patterned gold passement set with jewels and pearls. Instead of the billowing veil shown in the first figure, this has some very transparent gauze stretched upon an ornamental wire frame, which is bent round the headdress and attached to its top edge. A lamentable event at this time gave an opportunity to those whose function in life is the creation of “new modes” (though history usually shows a precedent for each innovation). 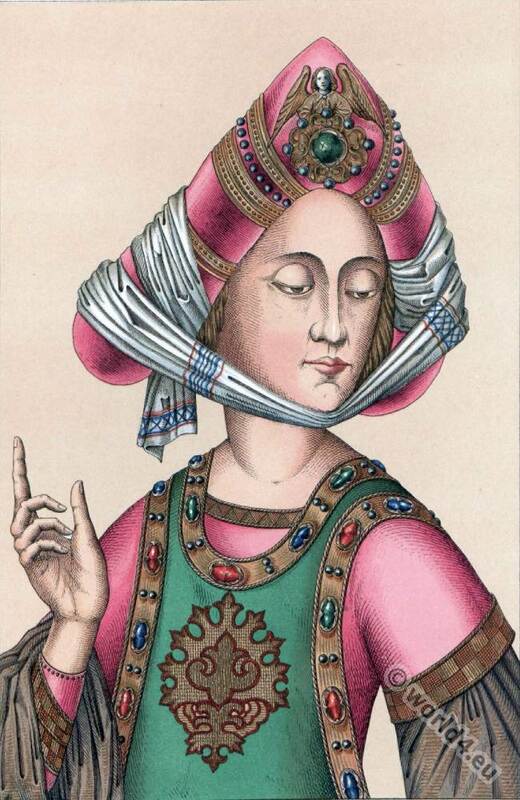 The fall and sack of Constantinople by the Turks in 1453 inspired the ladies of Western Europe to adopt a version of a Byzantine headdress. This was the coiffure resembling an Oriental turban. It was composed of all kinds of rich materials made up on a foundation. Fig. 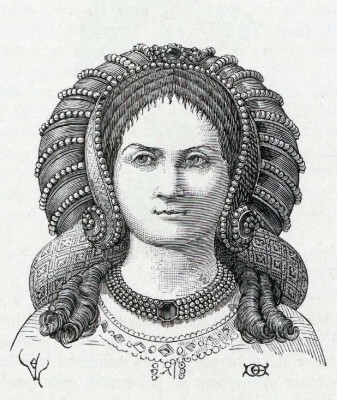 616 C shows a turban headdress of this kind. The folds of gold or silver tissue are fixed in place by bands of jewels. They might cover the head completely or be hollow in the centre, the turban surrounding the head roll-fashion. Frequently the wearer’s long plait of braided hair passed through the roll and fell down the back over the rim. Fig. 616 D shows another kind of folded turban, with a veil draped under the chin and caught at the top, whence the long ends fall and float in the breeze. 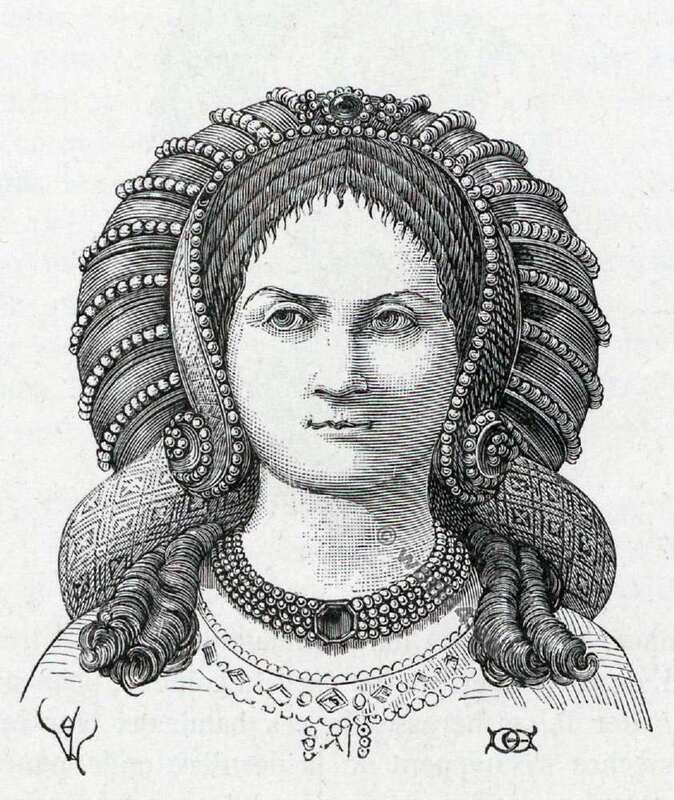 Rolls of fur often composed this turban headdress; they were usually hollow in the centre, and had a cluster of jewels placed in front, from which arose, sometimes, an upstanding plume. Great originality was displayed in the designs of these turban headdresses, which remained in fashion in England, and on the Continent, until the end of the century. Many of them, worn by great ladies of Italy, are seen in portraits of this time. 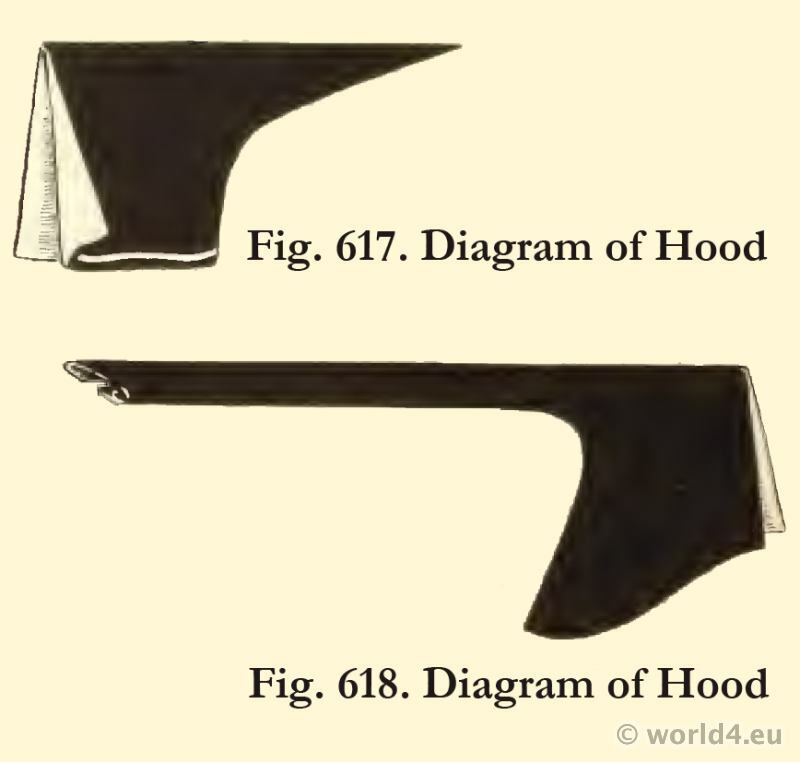 Hoods of various shapes continued to be worn by women of the middle and lower classes throughout the fifteenth century. Their respective shapes being shown in Figs. 617 and 618. Diagram of Hood 15th century. They were usually made of black cloth lined with a colour visible where the front edges were turned back. Well-to-do women sometimes had these hoods made of black velvet. Eleanor of Castile first wife of King Edward I. 13th century. 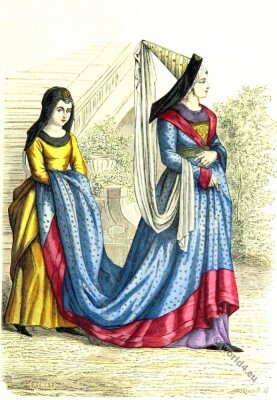 The development of the Hennin. This entry was posted in 1410, 1420, 1450, 1460, 1470, 14th Century, 15th Century, Burgundian dress, Court dress, England, Fashion History, France, Headdresses, Middle Ages, Nobility and tagged Burgundian fashion period, Gothic costumes, Hennin, Medieval costume on 9/29/14 by world4.